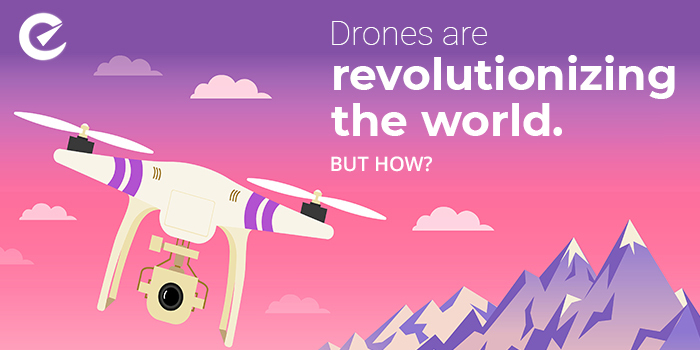 Drones are revolutionizing the world. But how? The sale of drones is increasing drastically. The reasons are briefly mentioned below. Just like others new technologies, Drones are also slowly conquering the world. Their demands are everywhere, starting from the country’s security personnel to entrepreneurs, even the public. Photography and Videography- Most important reason behind gaining popularity is that, drones nowadays comes with better camera option which helps the photographer or the cinematographer to shoot high quality pictures and videos that too from a great distance and for longer time. Videos and images clicked through drones helps in showcasing a different perspective altogether, which is also beneficial for the film makers, as their cost of film production comes down. Even photo journalist also can take an exclusive images of the news to be published, to let the reader have a clear picture of the entire news. Surveillance work- Currently drone has taken over the surveillance work which is sometimes considered to be life threatening, especially while dealing with the rioters or wild animals. Security personnel can spy on the insurgents which helps them to enforce the law accordingly. Moreover, because of the 3D enabled Technology, any accidents can be recreated to find out the main culprits. Rescue operation- in case of any emergency situation occurring anywhere around the globe like- floods or earthquakes or any other natural calamities where it is impossible for conventional vehicles to reach, drones can get over there very easily , giving a clear picture of the surroundings. The service of drone is not only restricted till there. Drone can help in transferring food, medicines and other necessary products, thus, helping the military personnel in rescue operation. Weather forecasting- Meteorological department from around the globe are using drones to get correct data which helps them in weather forecasting. Drones can help the department by investigating the weather condition, so that those places are evacuated before the arrival of the storms. Claim of insurance coverage- Because of the high-resolution camera, it is possible for the insurance company to get detailed information of any property damage where physical inspection was necessary, ensuring the insurer receives suitable insurance cover. Help in waste management- Drones are able to serve the environment, in a better way, by collecting the wastes from the surroundings. Most of the litters that we through goes to the rivers or oceans. Drones are now playing an important role by collecting all the wastes from there, thus helping in waste management. Satellite farming- this farming concept is based on technology that helps in increasing the crop harvests and making profits and decreasing the use of other traditional elements like water, herbicides, fertilizers. Drone helps farmer in taking strategic decision by surveying the entire farmlands, conducting soil and irrigation testing, planning the application of pesticides and finding any other mechanical faults in instruments. Drones have other functionalities too. The list is huge. But, like every other technology, sometimes even drones are misused. There are thousands of cases pending against it. It depends upon us how we are making use of the technologies. Previous PostPrevious You can deliberately earn money through “Facebook Research” app. Next PostNext What can be the consequences, if you deactivate Facebook for some time?